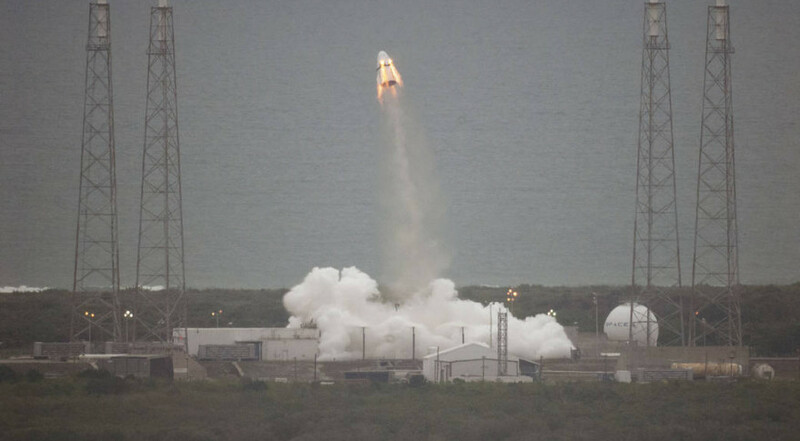 WASHINGTON — A SpaceX Dragon spacecraft roared off its Florida launch pad May 6 in an abort system test the company deemed successful despite a minor problem with one of the spacecraft’s thrusters. The Dragon spacecraft launched from SpaceX’s launch pad at Cape Canaveral Air Force Station at 9:00 a.m. Eastern time, at the beginning of a seven-hour launch window. The spacecraft’s eight SuperDraco thrusters fired for six seconds, accelerating the spacecraft on a brief flight that ended a little more than a minute and a half later with a splashdown just offshore. The test is one of two of Dragon’s abort system, designed to accelerate the spacecraft away from its Falcon 9 launch vehicle in the event of an emergency. The SuperDraco thrusters, located in four sets of two near the base of the capsule, are designed to quickly push the vehicle away from its rocket. That is a different approach from the “tractor” launch abort system, featuring a tower above the capsule, used both on Apollo and by NASA’s Orion spacecraft. 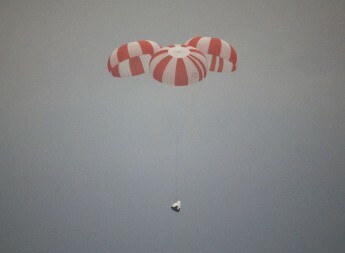 SpaceX chief executive Elon Musk said shortly after the flight that it appeared to be a success. “I think this bodes quite well for the future of the program,” he told reporters during a teleconference about two hours after the test. Dragon, he said, accelerated from zero to 160 kilometers per hour in 1.2 seconds, and reached a peak speed of 555 kilometers per hour in the test. NASA also praised the test. “Congratulations to SpaceX on what appears to have been a successful test on the company’s road toward achieving NASA certification of the Crew Dragon spacecraft for missions to and from the International Space Station,” Kathy Lueders, manager of NASA’s commercial crew program, said in a statement after the flight. The Dragon carried more than 270 sensors to measure its performance during the flight. 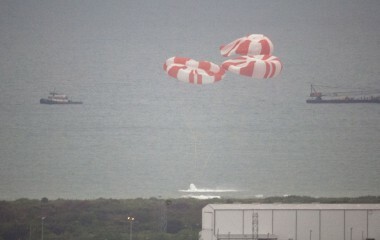 During a pre-flight press conference at NASA’s Kennedy Space Center May 1, Hans Koenigsmann, vice president of mission assurance at SpaceX, said the capsule, once recovered from the ocean, would be transferred to the company’s Texas test site for additional study, then refurbished for a later in-flight abort test. Besides the sensors, the Dragon carried a dummy designed to measure the flight environment’s effects on a human. At the May 1 briefing, Koenigsmann called the dummy “Buster,” but SpaceX later said that was incorrect. “Our dummy prefers to remain anonymous for the time being,” the company said in a May 4 statement about the test. Regardless of its name, Musk indicated at the post-flight briefing that it came through the flight in good shape. “It’s all good on that front,” he said. The test, though, was not flawless. During the flight, a controller said that the vehicle’s speed was “slightly below nominal.” The vehicle splashed down approximately 99 seconds after liftoff, according to video of the flight, eight seconds earlier than the timeline SpaceX provided prior to the flight. SpaceX carried out the test as one of four remaining milestones in its Commercial Crew Integrated Capability (CCiCap) award it received from NASA in 2012. Another milestone in that award is an in-flight abort test, where the Dragon will separate from a Falcon 9 after launch at the point of maximum dynamic pressure on the vehicle. That launch is tentatively scheduled for this fall from Vandenberg Air Force Base in California, but Musk suggested it could take place after an uncrewed orbital test flight that is part of the commercial crew contract it received last year. “It’s not clear which will precede the other,” Musk said of the two tests, adding that both would take place in the next year and a half. Completing those tests, and other spacecraft development tasks, would set the stage for the start of crewed Dragon missions. “Hopefully in two years we’ll be transporting astronauts to the space station,” he said. The abort system is also intended to permit powered landing of the Dragon spacecraft if not needed for a launch abort, either on Earth or even other bodies in the solar system. At the briefing, Musk emphasized that potential alternative role for Dragon, stating that a Dragon launched on the company’s upcoming Falcon Heavy launch vehicle could land two to four tons of payload on the surface of Mars. “It should be quite versatile and useful in a lot of ways,” Musk said.